Words and Music: A 14th Century Latin Hymn. Translated by E. R. Charles and W. J. Blew. 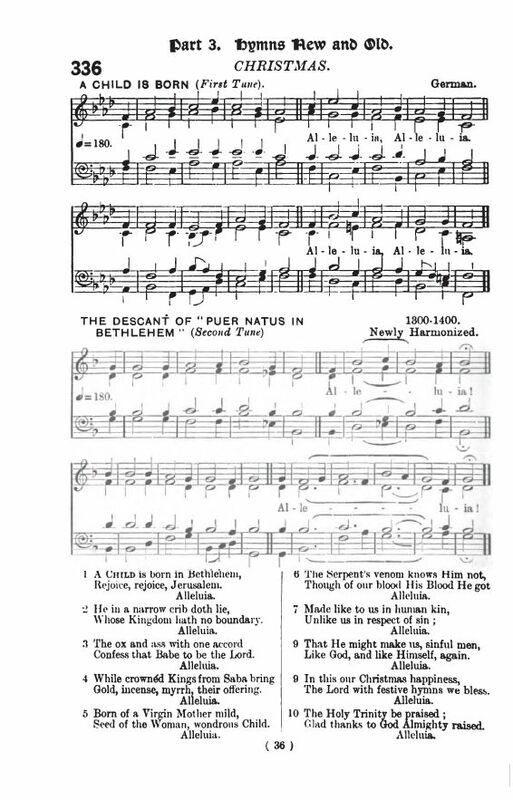 See: Puer natus in Bethlehem - from Piæ Cantiones, with notes and links to translations. Compare: A Child Is Born In Bethlehem, Rejoice, rejoice, Jerusalem. J. W. Hewett. 1859. Source: J. F. W. Bullock and C. J. Ridsdale, eds., The New Office Hymn Book. Parts III and IV. Edition K. (London: Novello and Company, 1907), #336, p. 36. Confess that Babe to be the Lord. Gold, incense, myrrh, their offering. Seed of the Woman, wondrous Child. Like God, and like Himself, again. The Lord with festive hymns we bless. Glad thanks to God Almighty raised. Sheet Music from J. F. W. Bullock and C. J. Ridsdale, eds., The New Office Hymn Book. Parts III and IV. Edition K. (London: Novello and Company, 1907), #336, p. 36. The items mentioned in verses 3 and 4 are discussed in the notes to Puer natus in Bethlehem.